Payless (as in the discount shoe store) just pulled off the prank of the century. In an experiment that set out to prove shoppers will pay top dollar just for a label, the brand opened an extremely fake boutique called Palessi and invited a group of influencers to come shop the brand's new styles. But wait for it—all of the "designer" Palessi shoes were just $20 kicks from Payless. A great stunt! In the real world, Payless filed for bankruptcy last year, and closed over 900 stores. First, its core business was crippled by weak mall traffic and competition from larger retailers. Second, private equity firms acquired Payless’ parent company in 2012 for $2 billion and left the chain drowning in debt. Payless’ bankruptcy filing listed liabilities between $1 billion to $10 billion, compared to just $500 million to $1 billion in assets. Despite restructuring agreements, stores continue to close, including the one above at Fifth & 10th. With Fabco closing earlier in the fall, it's the last budget shoe store on this part of Fifth. Several years ago, I looked at the shoe store history of Fifth between 10th & 22nd Streets, once a mecca for footwear. With Payless on the way out, I did a little amateurish research on its building's retail history. The first business reference I could find for 472 was for sewing workshops, with an 1872 ad for jobs in a third-floor loft. 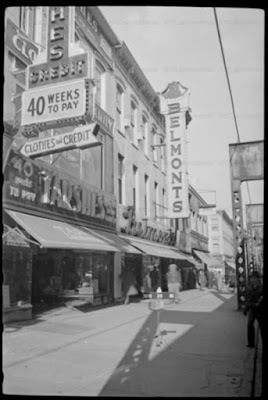 By the 1890s there was a shoe store - M. & B.M. Carlile's - at 472, operating next door to Zeitz and Tarshis credit clothing store, which had moved from a location above 9th Street. 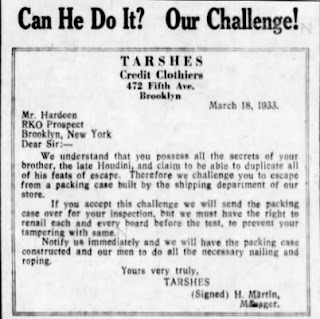 By the 1930s Zeitz was gone, and Tarshes, sporting a changed vowel, was at 472. 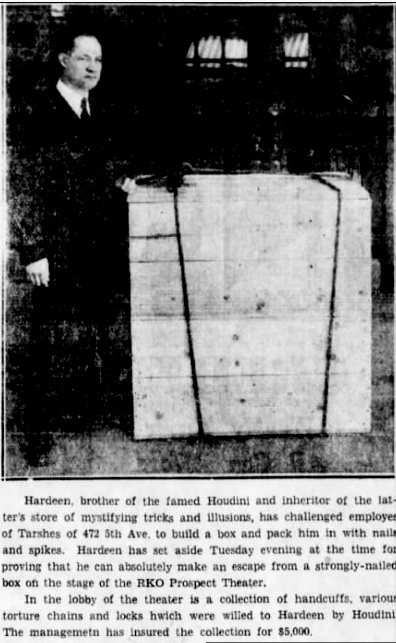 In 1933 a Tarshes publicity stunt involved Hardeen, brother of the late Harry Houdini. Did Hardeen escape the box? Oh come on Eagle! - I could find no account of the outcome. As a credit clothing business, Tarshes, like Payless, targeted a lower income customer. 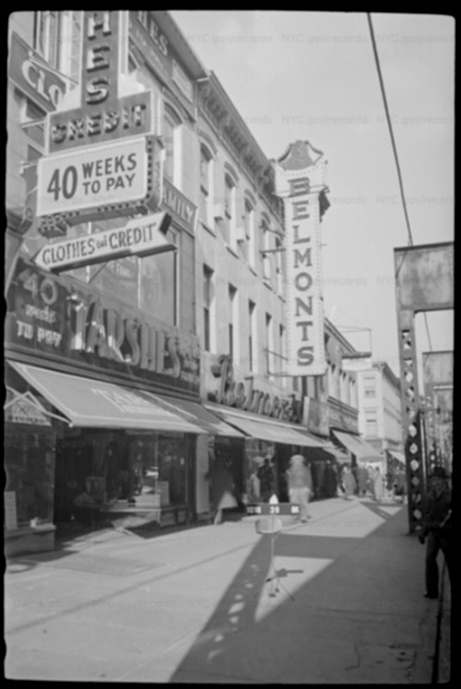 Here's a (DoF) shot of the building in the early 1940s, right around the time the El was removed. Towards the end of the decade Tarshes became Uneeda Credit store, and a few years later Peggy Ann clothes took over. If you lived around here between the 50s and 80s, you might remember what replaced Peggy Ann. To me it's a mystery. In the 1980s there was a store called National here, but the fuzzy tax photo won't reveal the nature of its wares. There was a shoe store next door at 468 (Classy? Classic?) later demolished to make way for Rite Aid.